Caterers are food preparers who are hired to cook, arrange and serve food at locations outside a restaurant setting. Most often their services will be secured for special events such as wedding receptions, business luncheons and large parties. Caterers may work for an event planning company, but they are often self-employed or restaurateurs who cater their food as part of their business. Why did you choose to open Sunflower Catering? Lydia, my wife and partner, and I had many years combined experience in the hospitality industry. We got to a point where we recognised a need for a one-stop shop for events and catering, where clients could arrange a complete function through one company without needing to search all over for the different services required, i.e. food, bar, staff, hiring, décor, venues and entertainment. So we launched our own company and it has proven to be very successful. What are the quirks of the business? Our business is unusual in that we are often asked to create new concepts and themes for functions in unusual places such as on boats, on top of mountains and in wine cellars. What training did you undergo? I was trained through the Wits Hotel School and also completed a Southern Sun Hotels three-year in-service higher diploma. Lydia learnt the ropes working in the film industry, catering for shoots on set. What makes for a good caterer? Before you get into the industry, you need to establish whether you have a passion for food and entertaining. You need to be an outgoing, strong-willed person with a lot of energy and enthusiasm. You also need to be creative, patient and have an eye for detail. Catering can be very stressful as you are dealing with people, food, time and constantly changing environments where many things can, and do, go wrong. You have to be able to think on your feet and find creative solutions to any issues that may arise. Experience versus formal training? I have certainly learned more on the job than through formal training, although a solid educational grounding will give you the confidence and motivation needed to succeed in this game. Describe a typical day on the job A function begins with planning, planning, planning. If you are well prepared and have checked all the finer details, the execution should be seamless. We finish the cooking and packing of vehicles early (if possible), and usually arrive at a function about two hours before to set up the bar, prep food and set up the venue. Complicated venues can take longer. Once the guests arrive it is all about timing, caring and detail. We carry on until the last guest leaves smiling. Then it’s clean up, pack up and head home. What do you enjoy the most? It is highly satisfying having a group of people enjoying a fantastic function that you have created. What are you least keen on? Catering can be highly stressful. There can be many hiccups that put pressure on the team and cause delays. Working with people is not always easy, but good planning is the key. What’s been the highlight of your career? Being awarded the contract to cater for the 2012 Junior World Cup Rugby by SARU and successfully handling all the venues, players and dignitaries without any major hiccups. We were also chosen as a finalist in the Cape Talk/Softline Pastel Small Business Awards. What are your goals for the future? 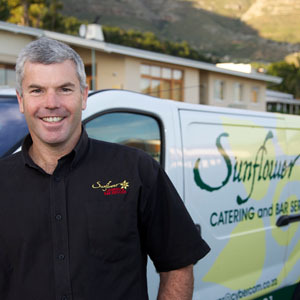 To see Sunflower Catering become a household name for its high standards and uncompromising attention to detail and caring. Describe your job in three words Stressful, rewarding and profitable. Caterer careers do not require any special education beyond a high school certificate. Many caterers begin by working in the food industry or for other caterers in order to gain experience. However, relevant degrees earned from universities, colleges or culinary schools may be useful for learning about preparing food. It is highly recommended to gain a qualification in hospitality or catering if the idea is to start one’s own catering business. Beyond taking courses in cooking, service and catering management, caterers might also benefit from taking business and/or marketing courses.